Unknown Unknown (Bailey) was born about 1795 in an unknown place and died in an unknown year in an unknown place. Dates for birth and death are estimated. 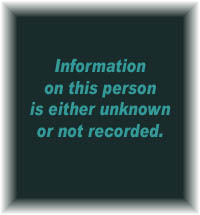 No information is known about this person. Date of birth is a "best guess". 64 1859 Charles Darwin publishes "Origin of Species" and begins the evolution theory. 70 1865 Mendel publishes his papers on genetics and introduces the concept to the public. 82 1877 Edison invents the phonograph permitting music and voices to be recorded and replayed. 84 1879 Edison invents the electric light bulb. 100 1895 Wireless telegraph and the "antenna" are invented but it covers a very short distance. 66 1861 NEWS HEADLINES: American Civil war begins at Ft. Sumter, located in Charleston Harbor, VA.
67 1862 NEWS HEADLINES: May 20, 1862 the US government passes the Homestead Act to provide cheap land for settlement of lower Southeast and West. 87 1882 NEWS HEADLINES: Edison creates the first large power station in New York City, making it the first place in America to have electricity. 90 1885 NEWS HEADLINES: Eastman invents the box camera. For the first time photography becomes affordable for the average citizen. 65 1860 Presidential election puts Abraham Lincoln in office. The campaign has heated the issues regarding slavery in the south. 67 1862 May 20, 1862 the US government passes the Homestead Act to provide cheap land for settlement of lower Southeast and West. 68 1863 Abraham Lincoln issues the "Emancipation Proclamation" freeing slaves. 70 1865 American Civil war ends with General Lee's surrender at Appomattox, VA. Reconstruction begins in the "old South"
73 1868 An eight-hour work day is established for federal employees. 80 1875 Tennessee enacts Jim Crow law. Born in Marion Co., South Carolina about 1830 and died somewhere in South Carolina about 1869. He was about 39 years old.